From OKC legacy to the Westbrook factor, Durant talks about his free agency experience. LAS VEGAS – Two weeks later, we still didn’t have many answers about Kevin Durant’s decision to leave Oklahoma City behind and form the NBA’s latest super team with the Golden State Warriors. His introductory news conference in Oakland on July 7 was the kind of controlled spectacle that makes it tough for reporters to dig too deep with the front-and-center subject. And besides, Durant’s head still seemed to be spinning so fast from the magnitude of his move that you could hardly get a real read on what was going on between his ears. But for 25 minutes on Monday, after the former MVP finished his Team USA duties in the national team’s debut practice inside UNLV’s Mendenhall Center, an engaging and honest Durant offered more clarity on what led to his league-altering move and those fascinating days that followed. What do you do when you know there’s a storm coming? You stay inside – and play video games. 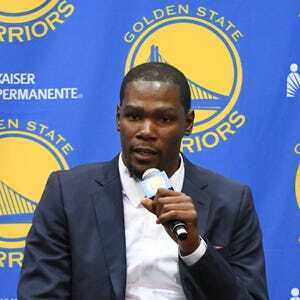 That was Durant after his decision on July 4, when he took shelter from the widespread criticism in that rented house in the Hamptons where his family, friends and associates had stayed after his meetings with six teams. “I didn't leave my bed, because I was like, 'Man, if I walk outside somebody might just try to hit me with their car or say anything negative to me,’” Durant said. “I just stayed in. I was trying to process it all. I wanted to be around family, and positive support. It felt different. Yet after two straight days of Xbox action with his younger brother, Rayvonne, Durant emerged to learn that the sun was still shining. There was certainly criticism, though, none louder than the dissenting perspective shared by Charles Barkley and Reggie Miller. 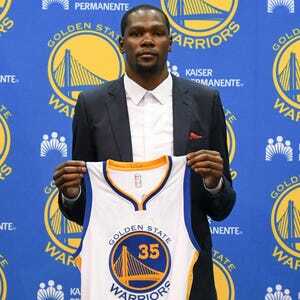 But as Durant said repeatedly, it wasn’t nearly as bad as he had imagined – not yet anyways. “Those are two guys, you know?” he said of Barkley and Miller. “They've got a voice in our game, and a lot of people probably felt the same way but they don't have a voice so obviously what they say is translated through a megaphone so it feels like everybody else (thinks that). If Charles Barkley said it, it must be true. If Reggie Miller says it, it must be true. Durant did quite a bit of hand-wringing on this front, denying the notion that chemistry issues with the Thunder point guard led to his departure. But truth be told, what in the world is he supposed to say about this sensitive subplot? It’s no longer a secret that Durant longed to play the game in the kind of free-flowing way that the Warriors employ, or that he had concerns about the Thunder’s station-to-station style that had them finishing last in the league in passes per game last season – by 11 per game, no less. There was a perceived ceiling placed on his goals with the Thunder, never mind that they had the second best offense in the league during the regular season and came within one game of reaching the Finals. As one Warriors person had described it even before Durant came their way, there are no hockey assists with Westbrook – the pass that leads to the pass that leads to the shot. More often than not, he’s either scoring on the possession or assisting. All season long, the Warriors’ intel that Durant had grown frustrated with that aspect of his Thunder experience was the root of their free agency confidence. And with all of that surely in mind, this was his best attempt at addressing the Westbrook situation. The more revealing part came shortly thereafter, when Durant claimed that he never discussed Westbrook’s uncertain future as part of his decision-making process. For all the focus on Durant’s court time with new teammates like Draymond Green and Klay Thompson at Team USA practice, there was another side to that new dynamic. He shared space with some old Thunder friends for the first time since leaving too. From Oklahoma City media relations man Matt Tumbleson to former Thunder assistant Monty Williams (a Team USA assistant) to recently-acquired shooting guard Victor Oladipo and Thunder trainer Joe Sharpe — there was no shortage of familiar faces. Thunder beat writer Anthony Slater was part of that OKC pack, too, and the Oklahoman newspaper reporter inspired a comical moment midway through when he asked Durant what kind of response he expects to receive in his return to Chesapeake Energy Arena next season. To which I joked that it would all depend on what Slater wrote in the days leading up to the reunion. Durant, the Seat Pleasant, Md. native who became such a pillar of the Oklahoma City community in his eight years there, spent quite a bit of time discussing the widespread anger from the fans he left behind. It won’t be enough to keep those boos from raining down when he comes back, but it was a wise move to take the high road here. “Having a chance to play in Oklahoma City for eight years, to see the city come together to support the team, I understand (why they’re upset),” he said. “I understand where they're coming from. It hurt me. 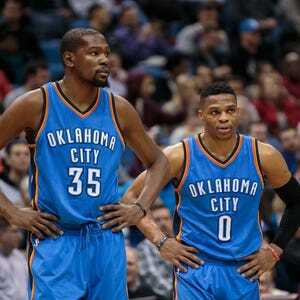 I was hurt for a few days because I know that I hurt so many people in Oklahoma City by changing teams. It will move on in Oklahoma City, too, but the what-if factor will never go away. They reached the Finals in 2012, the conference finals four times in six seasons and played so well in the postseason leading to Durant’s departure that Warriors forward Andre Iguodala said after the Cleveland Cavaliers won it all that the Thunder were the best team. In the years between, they endured a seemingly-endless stretch of injuries that ultimately undermined the championship pursuits. To hear Durant discuss the legacy of the team he decided to dissolve was, like the very sight of him wearing a Warriors uniform a few weeks back, nothing short of surreal. “Time will tell (how those Thunder are remembered),” he said. “We'll see. We had some great years. There were some great players who came there, had two great coaches who (came) through there. The arena was great. The fans were great. So nothing is going to change about Thunder basketball, what they stand on and what the organization stands on is not going to change. That wasn't built by just me. That was the whole community. That was the whole team. That was the whole organization that built what they have.